Okra is a vegetable that is used in soups and casseroles or is fried and boiled. It is a warm-weather crop, so it is primarily grown in southern climates. Okra is also sometimes grown as an ornamental plant in flower gardens, as it can reach a height of up to 6 feet and produces flowers similar to those of hollyhocks. Whether you use okra as a garden vegetable plant or as a floral, if you have a good crop you can save seeds from your prized plants for next year's garden. Leave one or two okra on the plant to mature. The okra is ready for seed harvesting when it is large and pale in color. Clip the okra off the plant with your garden shears. Set it in a dry, airy location to dry for 48 hours. Place the okra on a cutting board. 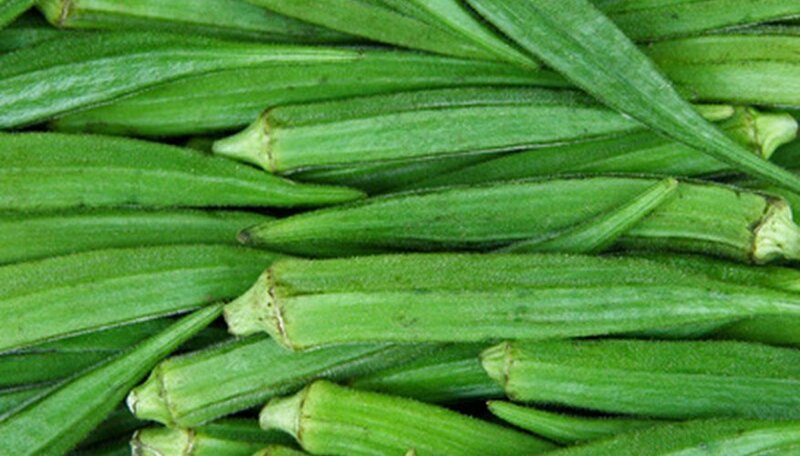 Take a sharp knife and slice the okra in half from top to bottom. Gather the okra seeds from the inside of the okra and place them on some paper toweling. Separate any plant debris from the seeds, and leave the seeds on the paper toweling for another 24 hours. Place the dry okra seeds in an airtight container, such as a plastic baggie, and store them in a cool, dry location until it is time to plant them. Okra seeds can also be saved in a sealed glass jar. Do not wash the okra seeds before storing them, as any excess moisture can lead to decay.